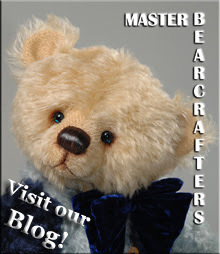 I am busy creating bears for the Christmas Treasures online show in November. I am not allowed to show any of my creations before the show opens...not even a peek! 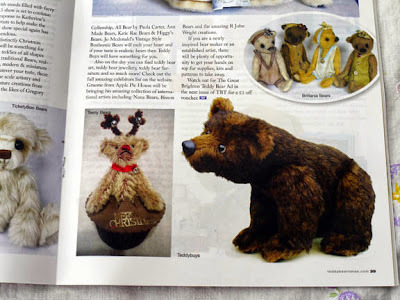 I am also starting to create for the Great Brighton Teddybear Event in December. There is a sweet photo of Teddybuys Whisper in the October\November edition of Teddybear Times. I have a collector and a shop waiting for bears, so am fitting these in around everything else. I am also making mug rugs for the Quilting Bloggers Fall Inspired Swap. I have a lovely swap partner, Zanna, who is South African but living in Bahrain. Oh, and I started the Advanced Quilting course at Kathy's Patch last Thursday and need to finish my New York Beauty block. I have made New York Beauty before, but this is a more complex block. I also have some polymer clay sculpts waiting for completion. I'm not sure it was a good idea to make a 'To Do' list (now that I see how long it is)!